Congratulation Linda Lansford and Toni Jensen you are the winners of our Braggables giveaway! I have been a long time fan of Braggables and cannot say enough great things about them! I have known the owner, MJ for several years - and being the small world that it is, it turned out that her business was only about 1/2 hour from where I live. Braggables was one of the first products I carried at I Love Photo Gifts when I launched that store and they continued to be one of my best selling items during my time as owner of the store. Well, Braggables has decided to kick it up a notch and offer a sale for the holidays that will make your gift giving a little bit easier! 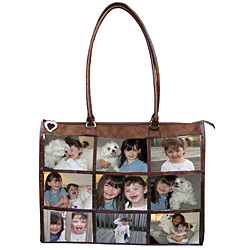 Their purses are a great gift for any mom, sister, grandmother, aunt or just about anyone who just loves sharing those special images of their pride and joy! 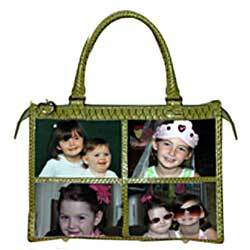 Make it an even better gift by inserting images in the purse and give it to the recipient ready to go! Today through 11/30/09 you can take 30% off EVERY item in their store - and to sweeten the deal if you spend more than $50 you can also get free ground shipping! And just because we love our readers...we are going to Give Away 2 Braggables Purses! No crazy entry requirements...just leave your name and email! But you better be quick - this giveaway will end on Friday 11/27/09 at 11:59pm! So if you do not win you still have time to take advantage of their great sale! We are giving away the (2) styles below..the 9 pocket will be brown and the 4 pocket satchel will be black not green as shown! Faux Suede 4 Pocket Satchel in BLACK!!! So, you want to win one of these great purses do you? Leave your name and email address in a comment on this post - yep, that's really it! Tweeting will always get you an extra entry of course, so Tweet away - just let us know you Tweeted in another comment! Deadline to enter: November 27, 2009 at 11:59pm 2 winners will be chosen at random using Random.org and will be posted here by November 28, 2009. Winner has 3 days to claim prize, if no response is received, another winner will be selected.